I know so many people don’t know how to successfully boil green banana and remove the it’s peel. 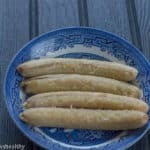 I wholeheartedly agreed that the skin of a green banana (cooking banana) is quite thick and cumbersome to peel and boil. However, you can remove the skin in a number of different ways. I’m going to show you the quickest way to do so. Some people prefer to peel off the skin in the uncooked form and then cook the bananas, while others prefer to release the skin by cooking the bananas first. I’ve tried both methods and find it much easier to boil the bananas in their skin and then take it off. 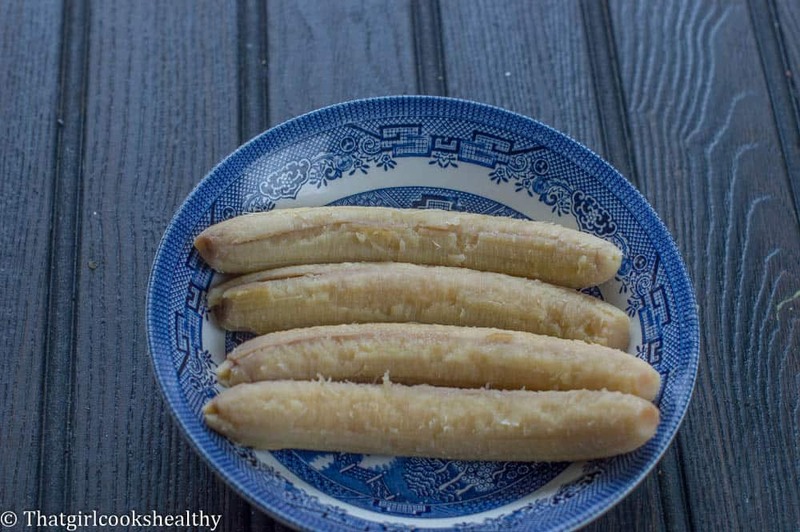 My grandmother had taught me plenty of times, how to remove the green banana skin before cooking it, but I’d much rather shy away from this method and do it my own way. 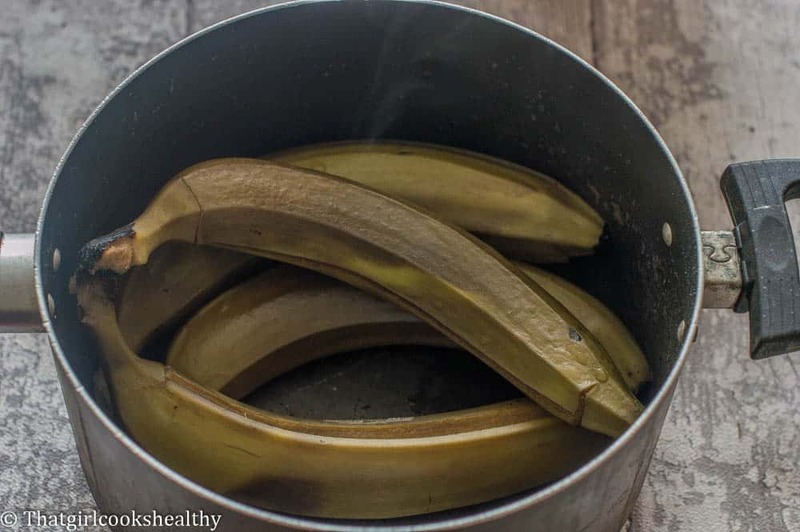 Fear not, those of you who are perplexed by this starchy vegetable, I’m going to reveal a simple way of how to boil a green banana while removing the skin at the same time. I promise you that this won’t be difficult and the clean up is minimal, so let’s get cracking. The first thing you need to do is wash the bananas and drain off the excess water. Once you have done that place the green bananas on the chopping board and position the green banana on its side. Start to cut both ends of the bananas, you can remove it in its entirety but I prefer to partially cut both ends, as it comes in handy when taking off the skin. Next, from the top of the vegetable, lightly score along the skin towards the end tip. Don’t drive the knife too deep into the flesh as this will come off with the external part, simply make the incision with the tip of the knife. Carefully add the bananas to the saucepan with pre boiling water and leave to simmer under low heat for roughly 20 minutes or until tender. 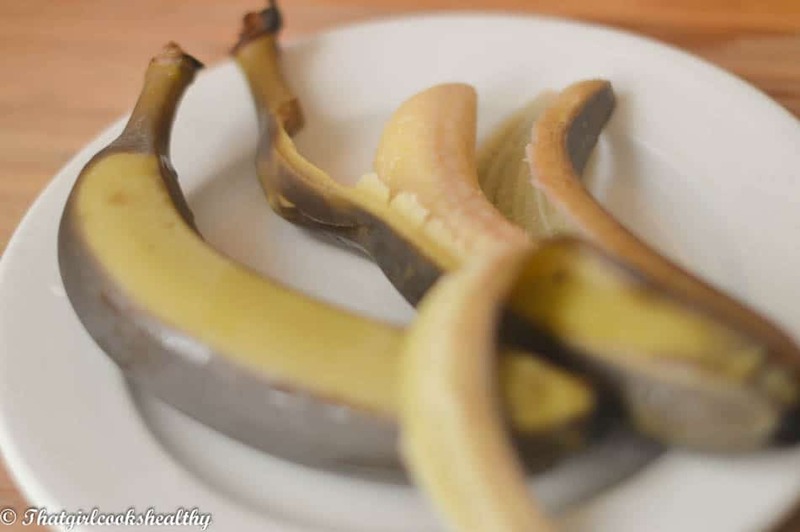 While the green bananas are cooking, you will notice that the peel becomes progressively darker. This is perfectly normal and simply part of the cooking process. After approximately 20 minutes, the bananas should be soft, you can determine whether they are cooked by pricking it with a fork. Once the bananas are completely cooked, remove saucepan from cooker and set aside until the water is cool and drain. 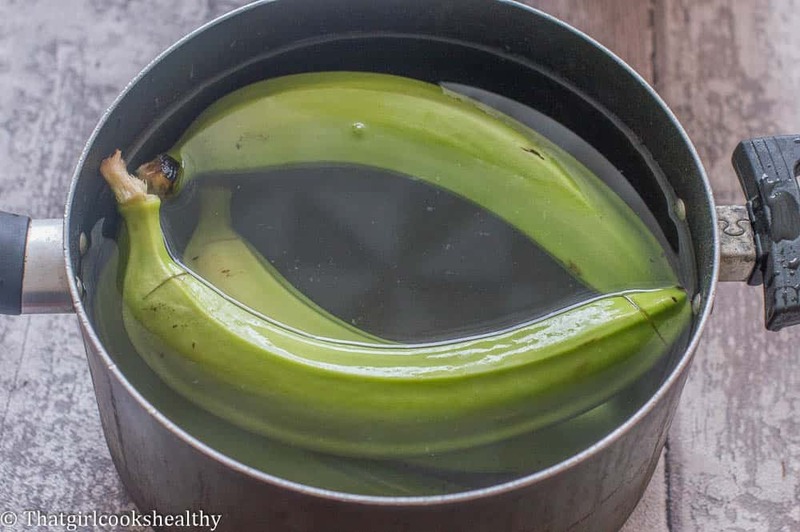 Remove the green bananas from the cool water and begin to take off the peel. Don’t worry at this point the peel should come off with ease. So there you have it folks, a quick and simple method of how to remove the skin of a green banana. 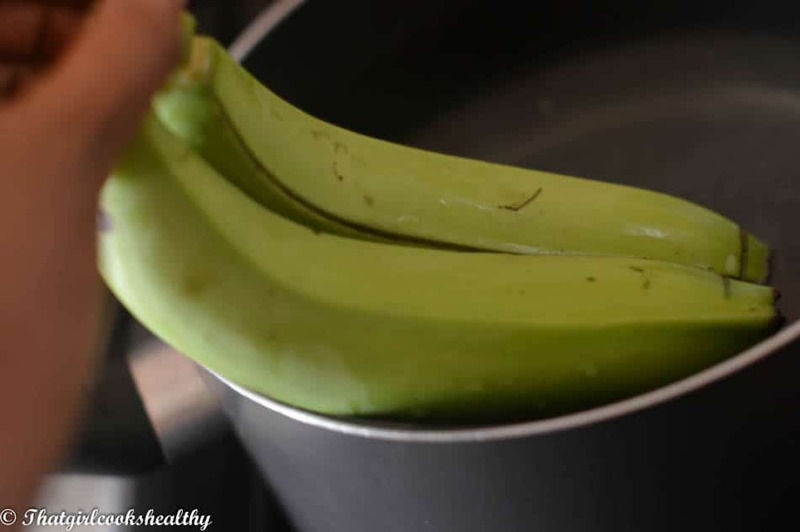 Learn how to boil green banana and remove the peel at the same time. Bring the pot with water to the boil then reduce to medium heat. 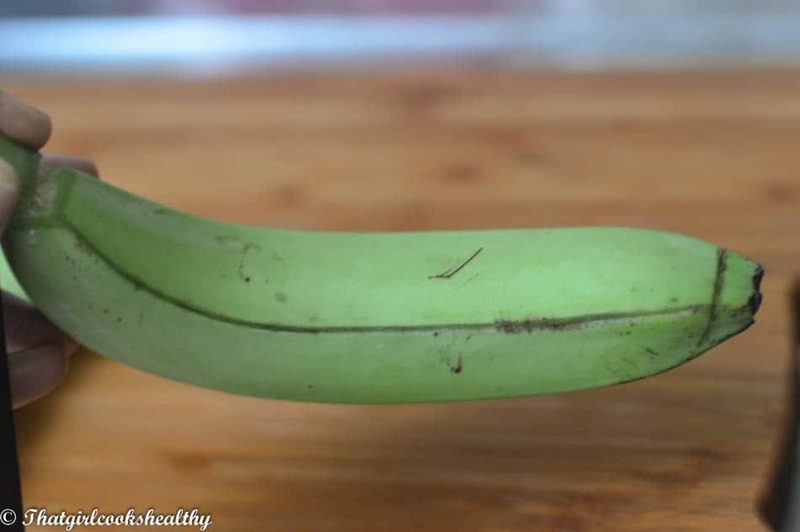 Place the green banana on a chopping board on its side. Partially cut the top and end of the banana (not completely off) then score the banana length ways (shallow not deep) so it meets the top and end. Thanks for posting. I have looked for a “sensible” way to prepare green bananas. Your method seems to be the best of all that I have seen. I decided there has to be a better way after preparing the tradition way (cut , score, peel, peel, peel, ….scrap…scrap… scrap) I will try your way the next time I prepare them. My your willingness to share be returned to you by 1000% percent in not only words, but deeds & $$. I used to have a love and hate relationship with green bananas growing up until I heeded the advice of my grandmother. I’m glad I could be of assistance to you, and if you need anymore help, just drop by. 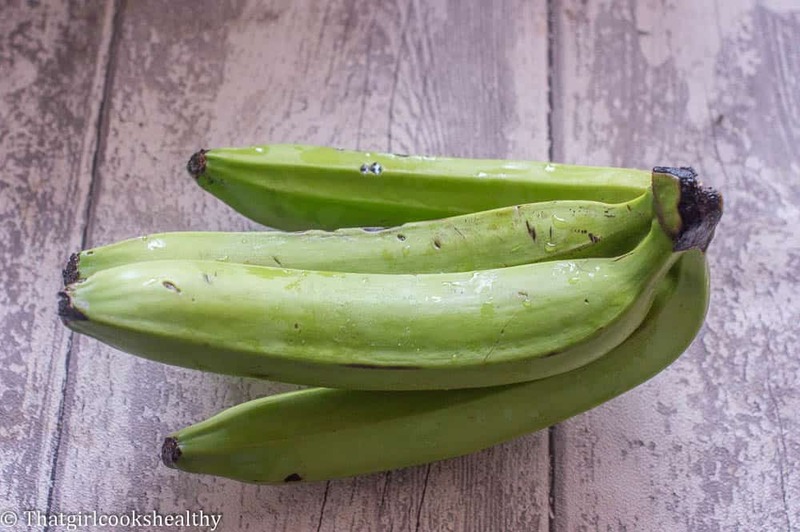 Yes, you’ll find green bananas in abundance in the Caribbean. Once you know how to peel them you can make good use of them too. Thanks for the tip. Ive made a big mess before and lost alot of the meat of the banana trying other methods. I think I may have ruined my pot. Banana gum is sticking to my sauce pan. How can I get it off? Try an oily substance like olive oil that should shift it or rub some diluted vinegar on it.